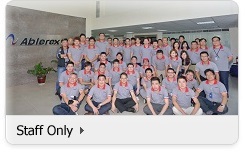 ﻿ Ablerex Electronics Co., Ltd.
2011 New Factory at Pingtung Taiwan for 3 phase product. 2006 Set up USA office. 2005 Set up 1st-owned Factory in Suzhou, China. 2002 Merged with UIS Abler Electronics Co., Ltd. and rename Ablerex Electronics Co., Ltd.
2013 Energy recycle system up to 120KVA. 2012 3 Phase PV inverter for 50KW. Set up Production Line for 3 Phase UPS in Pingtung, Taiwan. 2011 LCD Touch display Implemented in Ablerex product. 2010 Multi-Level converter for 100 KVA. 2009 3 Phase converter for 30 KVA. 2008 Wireless technology for Ablerex products. 2007 Set up A.I. & SMT line. 2006 Complied with RoHS& WEEE. 2004 ISO 14001 certified & ODM & OEM business. 2003 parallel redundancy technology / DSP based controller. 2002 R & D in Suzhou Factory, China. 2000 Cooperated with the Incubation Center of KUAS, National Kaohsiung University of Applied Sciences. Kaohsiung University of Applied Sciences. Copyright © 2011 ABLEREX Electronics Co., Ltd. All rights reserved .